Black Lives Matter activist Asa Khalif and state Rep. Brian Sims get into a heated conversation about racism in the Gayborhood. Khalif posted video of the confrontation to Facebook. A video published by a lead activist with Pennsylvania's Black Lives Matter chapter shows a heated encounter between him and a Philadelphia lawmaker about racism in the city's Gayborhood. 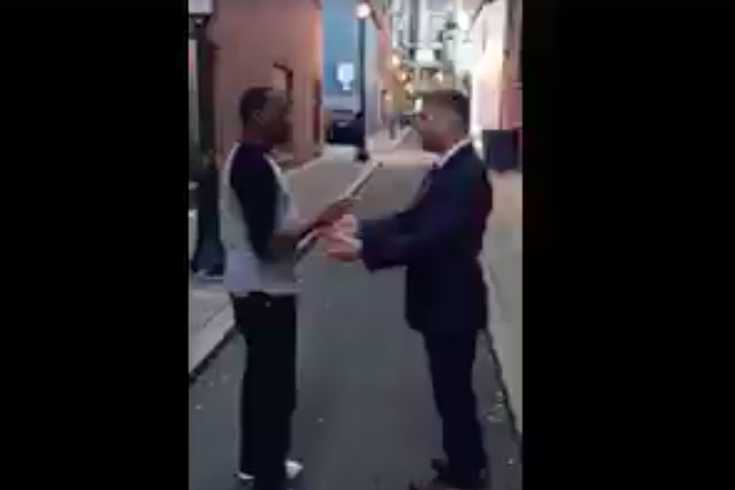 In the video, taken Thursday night, Asa Khalif walks up to state Rep. Brian Sims and challenges him on his alleged absence concerning the issues with frequent discrimination in the neighborhood, which historically has been considered a safe space for members of the LGBTQ community. Sims initially walks away from Khalif in the video, but eventually turns to confront him and claims he has invited Khalif to his office to discuss the issue on multiple occasions. Khalif denies this. In a statement to PhillyVoice, Khalif accused Sims of remaining "silent while black and brown people" were "repeatedly discriminated" against in the Gayborhood, which falls within Sims' district. Sims, elected in 2012, is the first openly gay person to serve on Pennsylvania's General Assembly. He has often advocated for LGBTQ issues during his time in office. Khalif, however, claims Sims was absent at the community meetings set up to address racism in the Gayborhood. Multiple attempts to reach Sims on Friday were unsuccessful. The Gayborhood's discrimination problems took center stage in September when video surfaced of Darryl DePiano, owner of the popular iCandy nightclub, using the N-word multiple times in a private meeting. DePiano apologized, but the incident led to community hearings and other allegations surfacing against similar clubs concerning their dress codes and ID policies, which advocates said unfairly singled out black and Latino patrons. The fallout from the controversy led to the resignation of two prominent LGBTQ officials in the city. Nellie Fitzpatrick, director of the city's Office of LGBT Affairs, quit earlier this year under criticism of how she had handled race-relation issues in the community. Nurit Shein, CEO of the Mazzoni Center, an LGBTQ healthcare provider, stepped down at the request of the center's board of directors in April. Protesters claimed Shein was responsible for a work culture that treated people of color on the staff unfairly, and that ignored sexual misconduct allegations by the center's now former medical director, Dr. Robert Winn. The Philadelphia Commission on Human Relations released a report in January recommending training for bar employees and staff at the Mazzoni Center in response to its findings of racism.